Fingers. OA of the fingers is often hereditary, meaning it runs in families. Fingers may ache or be stiff and numb. The base of the thumb joint is commonly affected. Fingers can become enlarged and gnarled. Small, bony knobs (called Heberden's nodes) may also appear on the end joints of the fingers. Similar knobs (called Bouchard's nodes) can appear on the middle joints of the fingers. More women than men have OA of their fingers as women become especially susceptible to OA after menopause. 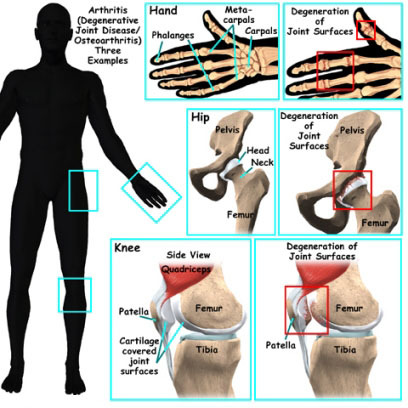 Although the exact cause of OA is not known, some scientists believe that joint damage begins in response to physical stress, such as an injury or repetitive movement. Also known as "wear and tear” this stress can erode the cartilage that normally encases the ends of the bones in a joint. 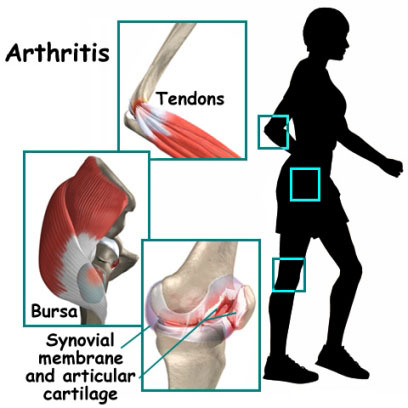 Cartilage serves to cushion the bones and to help the joint move smoothly and easily. Joint tenderness, warmth and swelling. Both sides of the body are usually affected at the same time. This is also called a "symmetrical pattern" of inflammation. For example, if one knee is affected, the other one is also. This is in contrast to osteoarthritis, where it is possible for only one knee to be affected. As RA progresses, about 25% of people with the disease develop small lumps of tissue under the skin, called rheumatoid nodules. These rheumatoid nodules usually aren't painful. The nodules may form under the skin of the elbow, hands, the back of the scalp, over the knee, or on the feet and heels. They can be as small as a pea or large as a walnut. RA is an autoimmune disease. This means the body's natural immune system does not operate as it should; it attacks healthy joint tissue, initiating a process of inflammation and joint damage. The exact cause of RA is not yet known. Although scientists do know that many factors may contribute to the development of RA - genetic, hereditary, and environmental factors may contribute to the cause of the disease. Researchers have found that RA can be triggered by an infection, possibly a virus or bacterium in people who have an inherited tendency for the disease. However, RA is not contagious; you cannot "catch it" from anyone. SLE is an autoimmune disease in which the immune system harms the body's cells and tissues. This can result in inflammation and damage to the joints, skin, kidneys, heart, lungs, blood vessels or brain. During my daily work routine, I see many patients not only in the age group of 40-60 yrs but also in their 20s, 30s, and 40s. They are an active population with many physical demands. Arthritis, or more appropriately called osteoarthritis (not to be confused with osteoporosis), might be thought of as an older person's disease. However, I see it nearly everyday on the x-rays of these younger generations.